Is there something in your space blocking you from allowing the energy of manifestation to circulate freely? 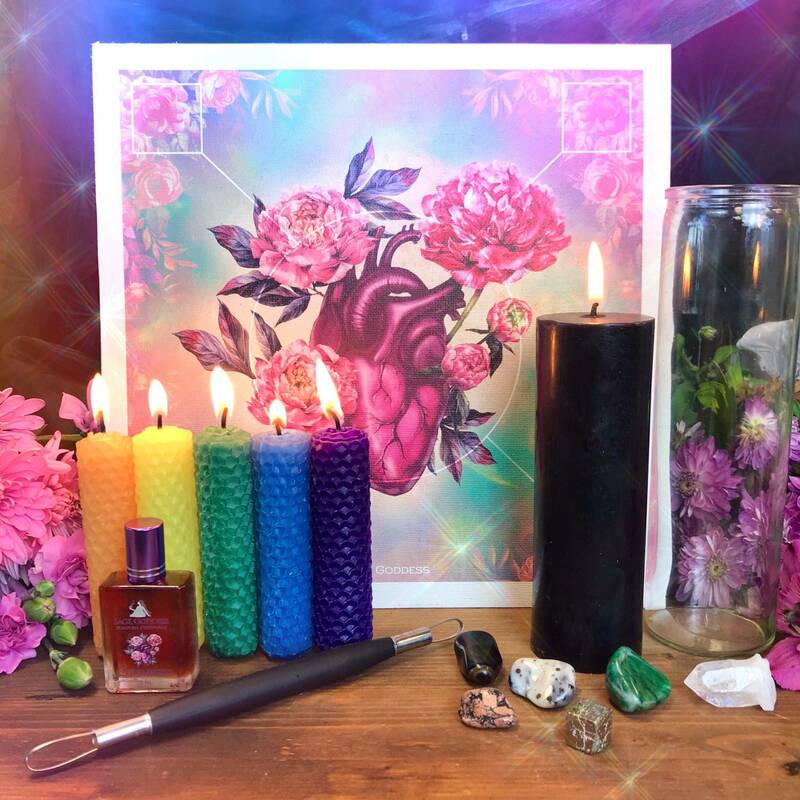 This Manifestation Mist was created using two of my potent and popular blends, with the sole purpose of clearing space for abundance to flow into your life with ease! A powerful combination wrapped in one offering, Manifestation Mist is a blend of Sacred Space Mist and Manifestation Perfume. Perfect for clearing energy and preparing your space for your utmost desires to materialize, this mist is potent abundance-conjuring magic. Infused with clear quartz and citrine chip stones to further amplify your abundance-seeking intentions, this Manifestation Mist is the perfect tool to uplevel your manifestation game! My Manifestation Mist contains two equally potent Sage Goddess oil blends: Sacred Space and Manifestation. Sacred Space is a wonderfully powerful blend of patchouli, white sage, and palo santo, and its energy is protective, grounding, and opening. Patchouli is said to be more powerful than any other essential oil obtained from a plant, and its essence digs deep. 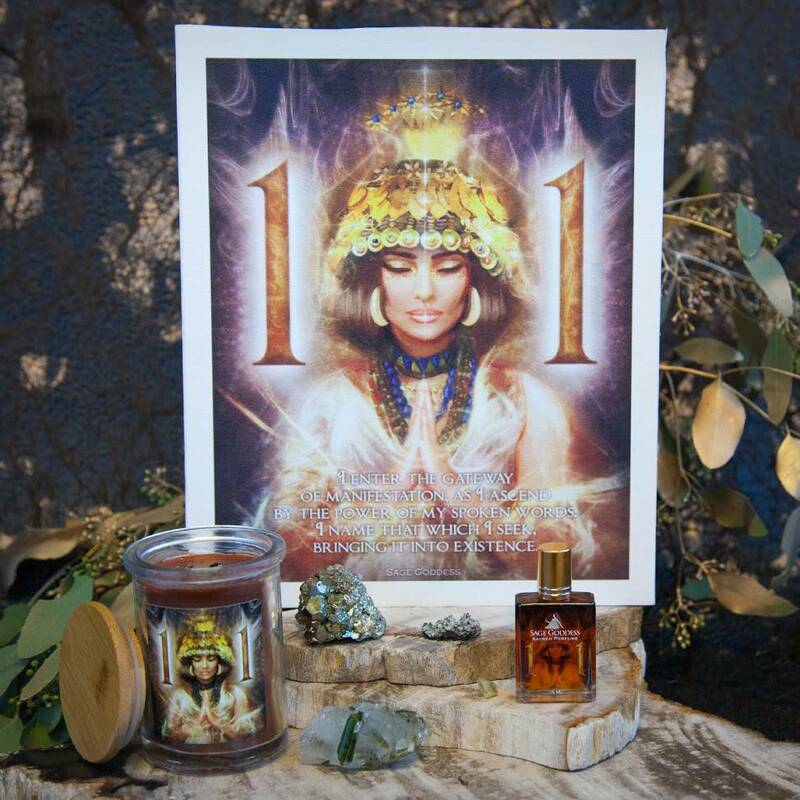 Anoint your sacred space with patchouli to draw money and success toward you. White sage is calming and soothing, and serves as an aid to enhance inner vision and clarity; it has long been used to purify environments. Lastly, Sacred Space contains notes of palo santo, the name of which translates to “sacred wood.” Palo santo is hailed for its cleansing and healing properties. Manifestation Oil is a major catalyst for your motivation and willpower. 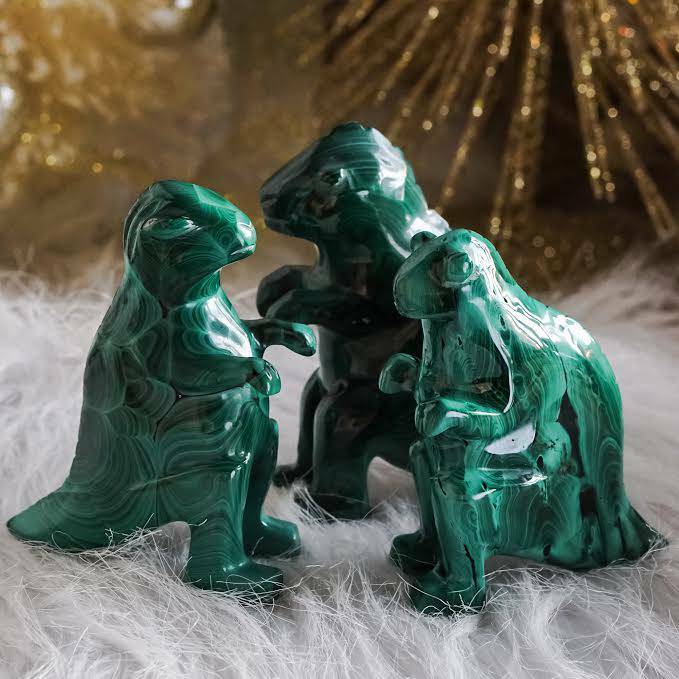 Made with the highest quality essential oils on the planet, including frankincense from Algeria, Australian sandalwood, and other attars, absolutes, and oils, this blend will focus your mind, body, and spirit toward achieving your goals, life’s purpose, and highest good. 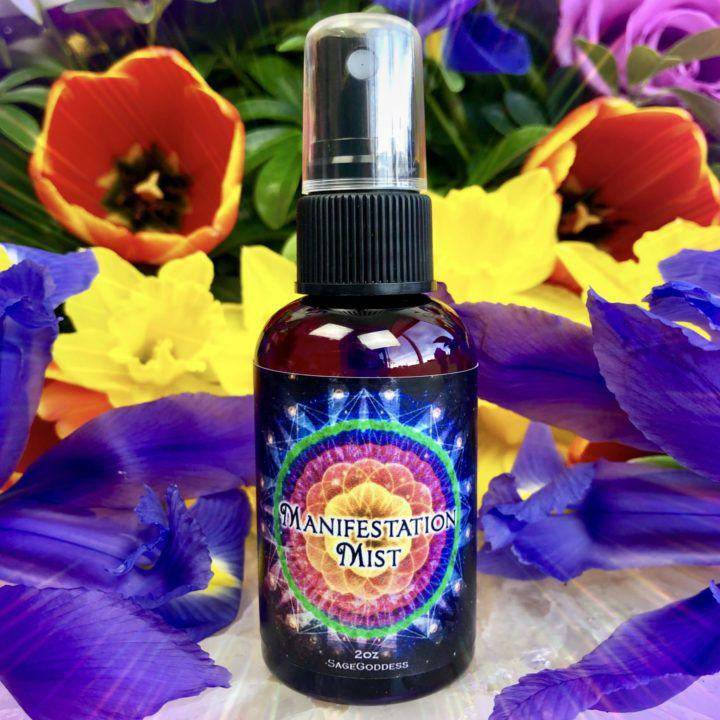 Work with Manifestation Mist to clear and stabilize your sacred and creative spaces. Allow it to support you as you write down your intentions and see yourself doing what you desire most. Feel how you would feel if you had already accomplished it, and allow it to come to you effortlessly. This listing is for one (1) 2 oz bottle of Manifestation Mist. Yours will arrive lovingly parceled for your enjoyment. Perfection of bliss and manifestation on point! !!! This mist is amazing. . It’s smells heavenly first .. but the way I feel when I put it on is awesome. Each day is different when I put it on. I stand and hold the bottle and I let it fill me up with what it wants me to manifest. I’ve only used it twice where I asked it to bring me something specific. The other times I let it’s magical energy work for me and trust in it . Thanks for creating this and I hope it’s a staple that will stay for a very long time. .. love you dearly athena and everyone at Sg. …. I love Manifestation Mist! It has all of my favorite oils!! Smells so heavenly. I spay it in my hair, on my clothes and my sheets. I received the employment I was manifesting..It really works!! I received one of my favorite samples, Sacred Sandlewood. Thank you SG. Love all my magical mail! I loved the sample I got. But now I have a whole bottle! The sent is wonderful! This stuff is so ridiculously delicious! I could smell it every day of my life and still never tire of it. I love this! It smells great! I wear it during abundance gridding & meditation. I spray the room to welcome an overall mood of manifestaion and give my medicine pouch a spray. I hope it becomes a regularly stocked item. Only complaint- my bottle did not come infused with chip stones. I love the fresh lift this mist gives me when I spray it on each morning after my shower. Athena, is a master-perfume blender, and layering this mist along with the other perfumes that I have from SG is spectacular. Chalice, and Raise the Vibe, scents all dance together in harmony!